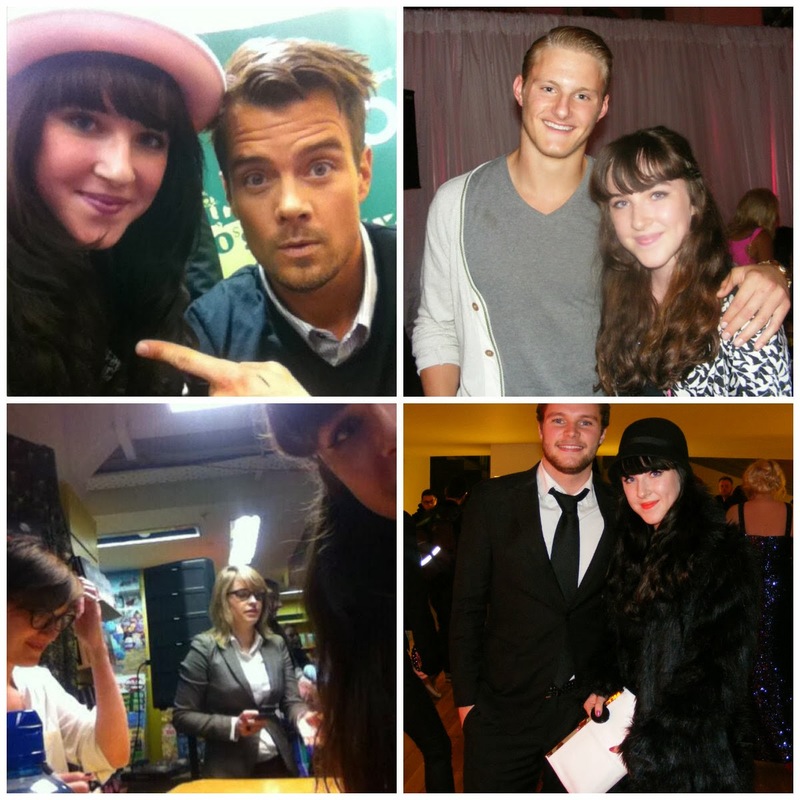 For some reason, 2013 appeared to be the year that I bumped into a good few celebs, mostly accidental. I won tickets to the Safe Haven premiere and met Josh Duhamel, Julianne Hough and Nicholas Sparks at the book signing I hadn't intended on attending. I met Alexander Ludwig, Cato from The Hunger Games [eeek!] at a fashion show, which was completely bizarre. I met Veronica Roth at a signing of her latest book Allegiant, although we weren't allowed get a photo, so I took a sneaky one as shown above. I met Jack Reynor, star of What Richard Did, at a film premiere. I also received Sam Claflin's autograph in the post [Finnick from Catching Fire- I almost died]. However my favorite of all has to been when I met Haim twice [once last May, once in December]. These girls have truly made my year really special, not just with their music but with their kindness. I've also met some amazing friends this year because of them, so thank you Haim! 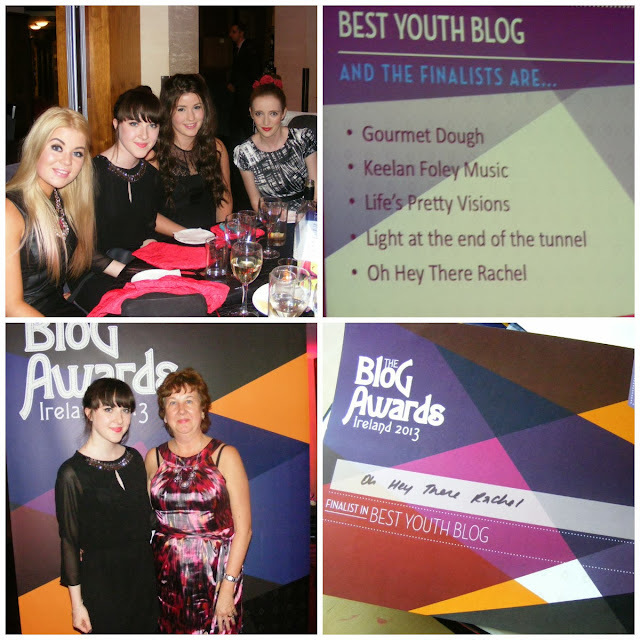 To my complete and utter disbelief, I was lucky enough to be a finalist for Best Youth Blog in the Blog Awards Ireland. 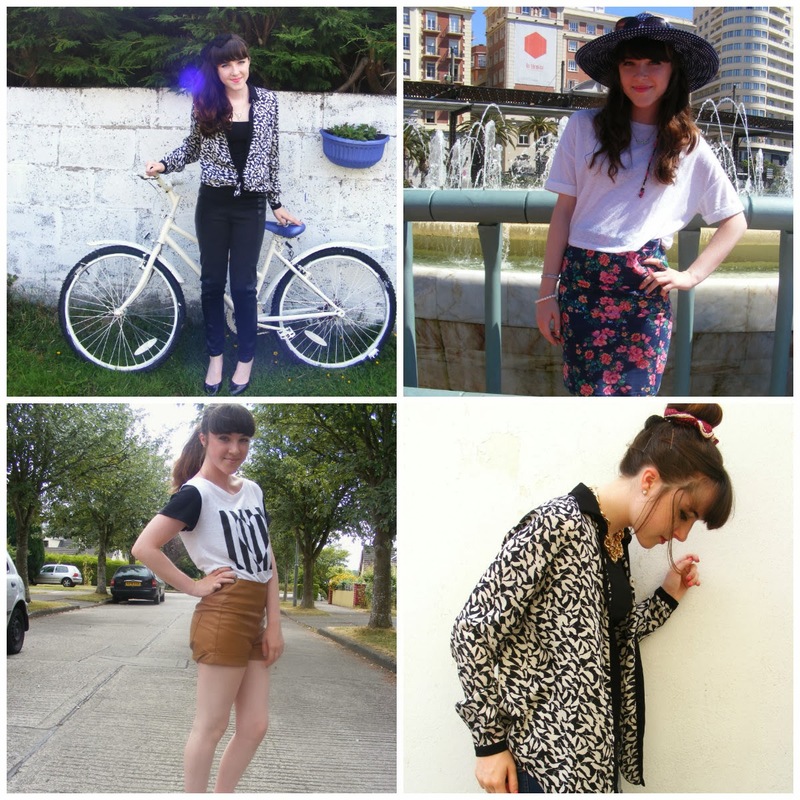 I hadn't even been blogging one year, which was amazing for me! 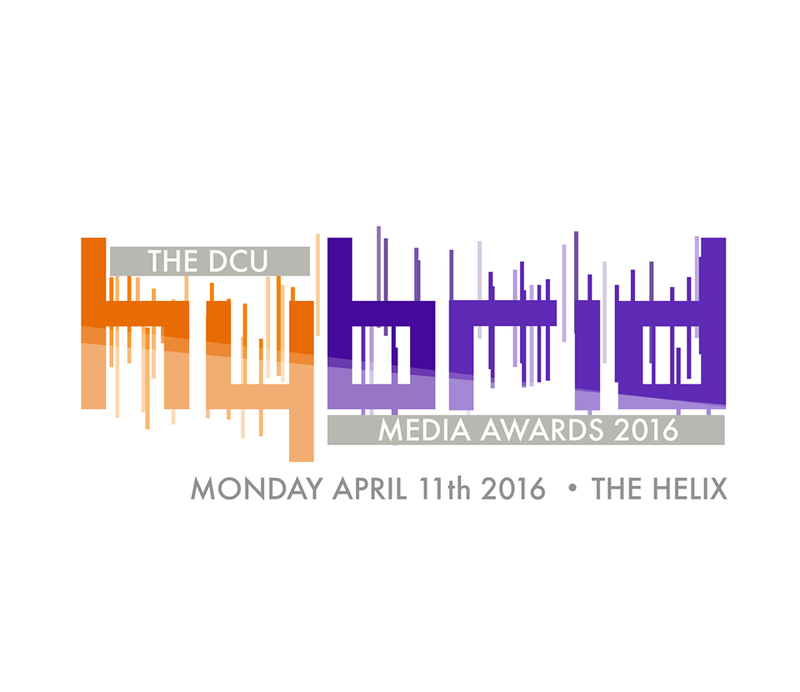 I had a brilliant time at the event- the dinner was lovely, there was a lovely atmosphere and a gorgeous hotel. I also got to meet some fellow bloggers [Megan, Rebecca & Shannon], which was also fab. Although I didn't win, I didn't care because it was an amazing experience! 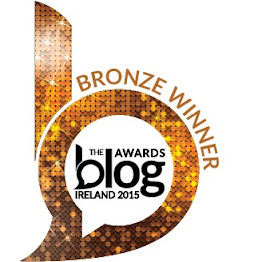 Here's hoping 2014 brings another nomination- how exciting would that be?! From around September onward, I received a couple of invitations to press events, which I really appreciate and thoroughly enjoyed. 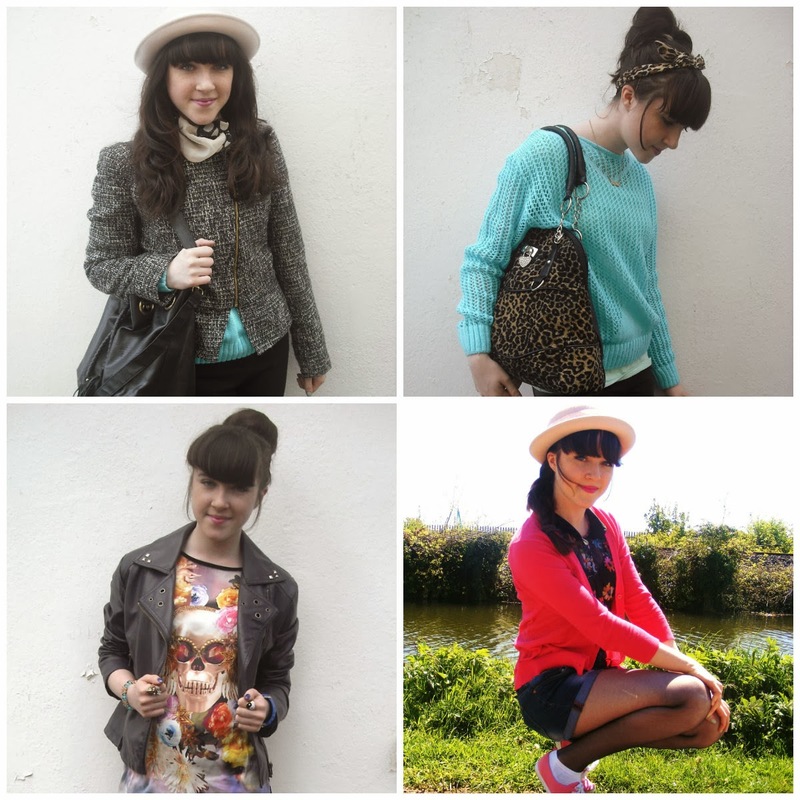 I attended the OohLaLa magazine launch and met fellow bloggers Leanne Woodfull, Hannah Hawkshaw and Ciara O'Doherty. 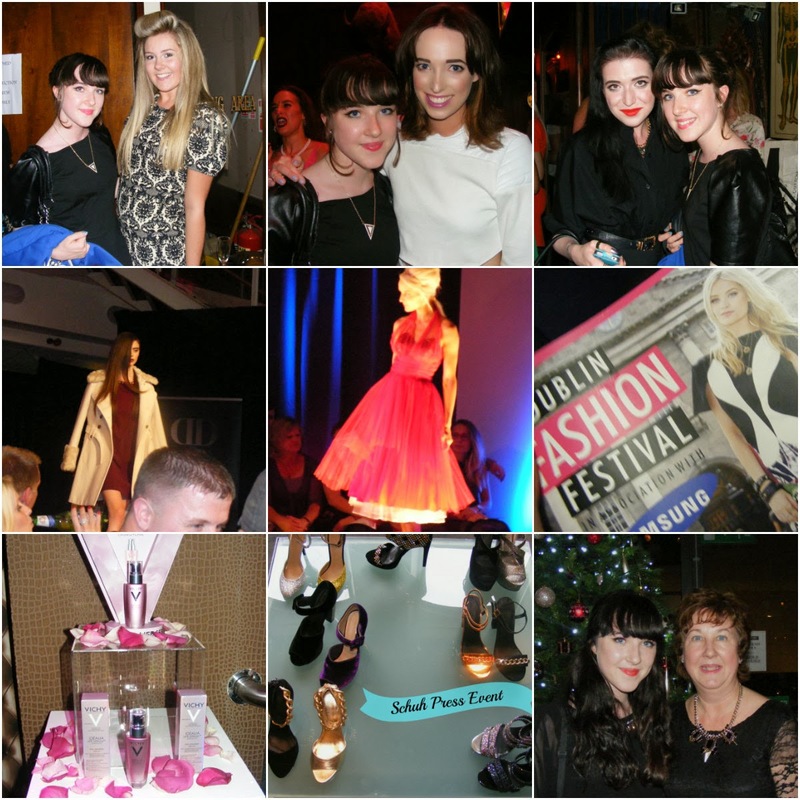 I attended alot of the events at the Dublin Fashion Festival, which was also a great experience. Although my plans for volunteering there fell through, I had a great time at the launch and various fashion shows. 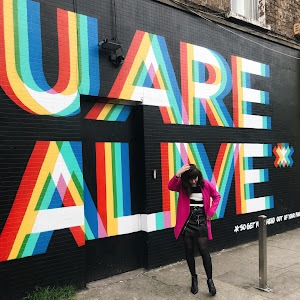 I went to the Vichy Idealia Life Serum launch- a new type of event for me, as I had yet to attend a beauty related event. That was also fab, and so pink! I atteded the Schuh AW13 Press Launch, and my aunt's short film premiere. Overall, 2013 was an exciting year, and although it had it's ups and downs, it was one of the best years of my life. I've made alot of new friends and been through alot of new experiences. Here's hoping 2014 is even better! I also have a very exciting business venture planned for 2014; my own brand called RCouture Nails! I will be designing hand painted false nails for reasonable prices. Check out here for more info or you can visit the store here. I hope you all had a magical Christmas. I has a great yet quiet day, and I was delighted with all my presents. I received my main gift, an iPhone 5S a few weeks before Christmas, but on the day I FINALLY got my hands on the Urban Decay Naked palette- yay! The last few days have been spent relaxing at home and watching way too many movies, but honestly it was great to have a break from school and just do.. nothing. Although it may seem cheesy, 2013 has probably been the best year for me. Not only have I been blogging the whole year, but I've met so many amazing people and been lucky enough to attend some great events. Rather than go through the year month by month, I thought I'd group together my successes in categories. I hope you enjoy reminiscing with me! I think it's safe to say that my personal style has really developed throughout the year! 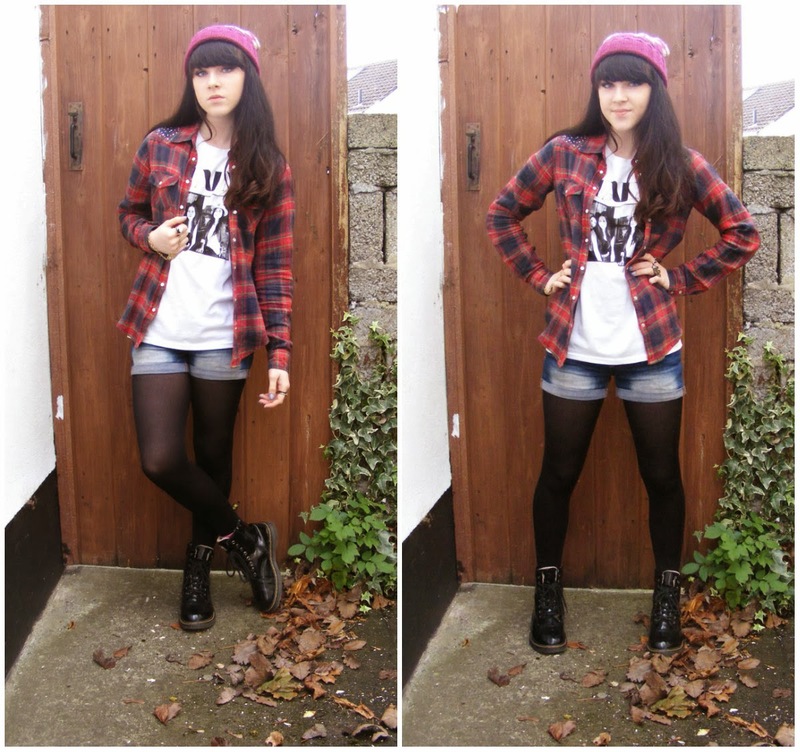 Thanks to blogging, I've began to really understand my fashion needs and what suits me the most. 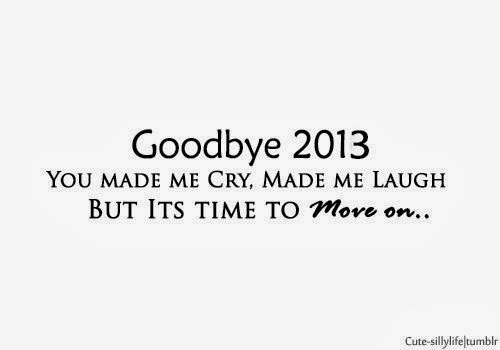 I can't wait for 2014, I just have this feeling it's going to be an amazing year. Hopefully! Which outfit was your favorite? Are you looking forward to 2014? Can you believe it's only 2 days until Christmas? I live for this time of year and its crazy that the time has arrived already. 2013 has been an amazing year for me, not only did things really take off with my blog but I met some truly wonderful people too. 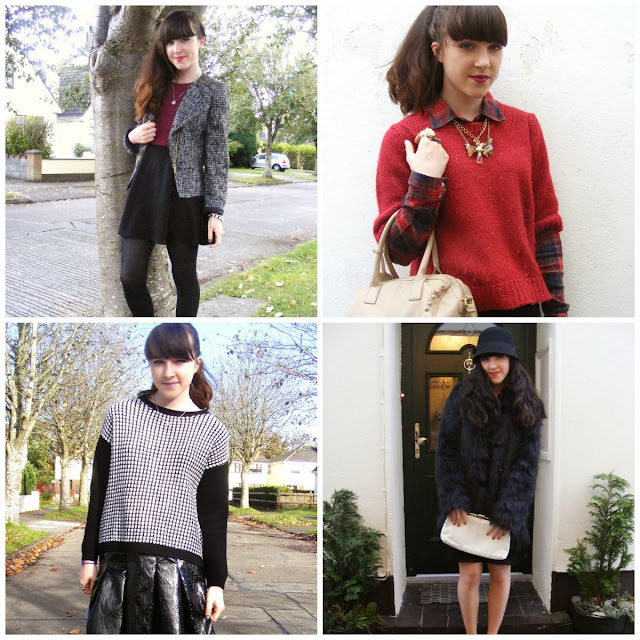 I'll be doing a roundup post of 2013 after Christmas so stay tuned! I was having a but of a casual day whilst heading to do some last minute Christmas shopping, so i threw together this outfit and dug out an old beanie for warmth. This will probably be my last post before Christmas, unless I have time to put one up in the next few days, so I just want to say Merry Christmas to all you readers [and I know, there's not alot]. You all have made my year the best year ever and here's to a fab 2014! 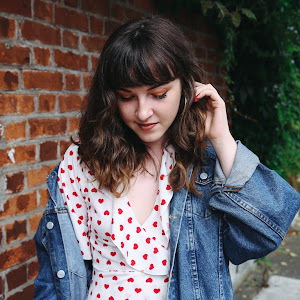 I was super excited to participate in a blogger secret santa this year, and I was lucky enough to be involved an Irish one. 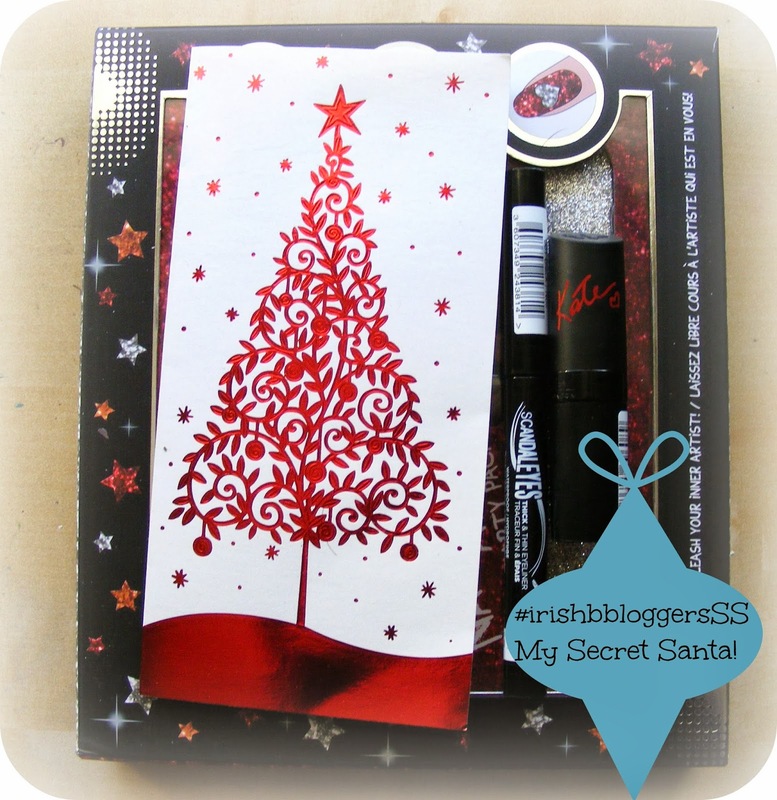 A blogger 'secret santa' is where you're matched up with a blogger, buy them a gift and send it to them! This year I had Sarah [enjoy!] and I can't wait to see what she thought of my gifts. The person who I received gifts from was Colette from The World In My Wardrobe . I'm so grateful for my gifts, they were so well thought out and items that I love. Here's what I got! - glitzy nail art Party Pack. I can't wait to glam up my nails for Christmas! As I'm sure you know by now, nail art and eyeliner are practically my trademarks at this stage, and I love trying new products, so this was a great idea. 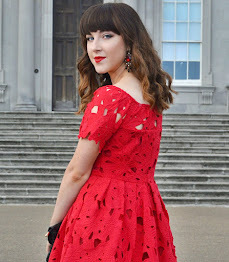 I was most excited to use the red lipstick as I had been on the hunt for a new red lipstick for AGES now! The Rimmel ones are among my favorites, so this was a lovely surprise. It's been a while since I've posted a nail art tutorial but the lighting is so dark after school to take pictures. I've had exams this week and they've all been finished before 3pm so I've had time to make one! 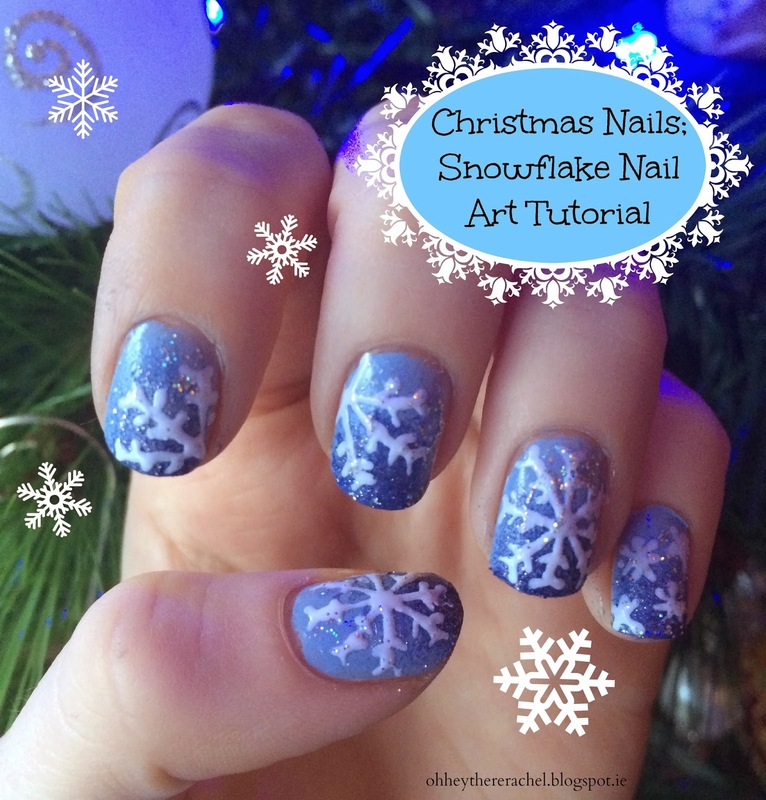 I was reading the lovely Megan's blog and loved her snowflake nails, so I was inspired to do my own! Colourwise, I was inspired by the movie 'Frozen' which I seen last week. It was the first animated movie I've seen in years but I loved it! Want to achieve this frosty look? Keep reading! I find it best to apply a basecoat before painting my nails, and a topcoat after. The basecoat stops the polish from staining your nails, and the topcoat will make it last longer and appear glossier. I use a Sally Hansen nail hardener as my basecoat, and an Essence topcoat. 3. Dip your sponge into this. I cut off a bit of sponge off a brillo pad! Lightly pat the sponge onto your nail, concentrating on the top of your nail. 4. When that's dry, draw a snowflake on your nail using white nail polish. I varied the design; a full snowflake on my ring finger and thumb, small snowflakes on my pinkie and half snowflakes on the rest. Google snow flake images if you're stuck for ideas! 5. Last but not least, lightly apply some glitter nail polish, but not too much that you can't see the design!